Notable Features : Filigree. Stone(s) : Bohemian Garnet, Pink & White Topaz. Approximate Age : Retro Style. About This Piece. Earring Type : Drop-Dangle. Approximate Age : Retro Style. About This Piece. Earring Type : Drop-Dangle. Earring Closure Type : Pierced-Hooks. The earring face has a unusual edge shaped like the outline of a leaf, a lotus leaf in fact: perfect for the lotus flower that is guilloche embossed within. The earring face was made in rhodium plated copper as many of the cufflinks of the period were. Stone(s) : Persian Turquoise. Approximate Age : Retro C. 1940 - 1950. Earring Type : Stud. Stone Cuts : Round Polished Bead. Stone Authenticity : Authentic. They are unmarked as to gold content but they have been fully tested and are at least 10k solid gold, possibly a little higher. The total weight of the earrings is 4.52 grams. Antique Victorian 10k Gold & Natural Red Coral Earrings. STONE: Approx. 0.32 TCW (1.7 mm) Diamonds. However, we will accept Cashier's Checks if noted upon checkout. HALLMARKED: 14K. EARRINGS: Approx. We pride ourselves in carrying high quality estate and antique jewelry. Gold filled vintage or antique earrings with oval black star sapphires. Sapphires are 7 x 6 mm Basket type setting with 6 mm rise Screw back posts No maker’s mark or hallmarks If you inspect with a loupe there is a hairline crack in the metal behind one of the studs. 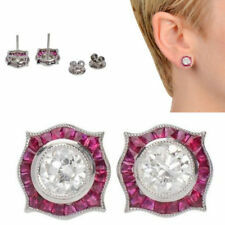 It’s not visible without magnification and does not affect the earring’s structure or wearability. Very good condition. Antique Vintage Black Star Sapphire Screw Back Gold Filled Earrings. Shipped with USPS First Class Package. These beautiful antique Victorian gold earrings feature a puffy dangling engraved intricate drop with an open work center with a gold bead in the center. Enlarge photos to see details. This fascinating design is made all the more dramatic by the Greek key framing edge. Add more glass and fire again.and again. Sand everything smooth, polish and then gild. Could they have ever imagined that we'd still be admiring their hard work these 135 years later?. I think it can be reglued but I prefer to leave that up to the new owner. Not sure if pearls are real. These were my grandmother’s. I often do not have more than 1 of each item. 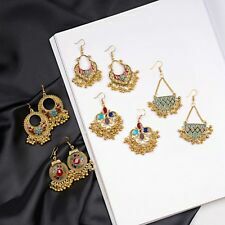 Elegant antique earrings! Set with genuine pink coral. Pierced style with lever back closure. Each earring is stamped with M 15. Floral design with a brushed finish on the petals in front. In great condition! All the carved coral pieces are in perfect condition as snuggly set in their wires. Exquisite pair of antique Chinese translucent celadon jade earrings mounted with gilt Sterling Silver. Each jade earring is fabulously hand carved from a single piece of jade. Highly polished and smooth and shiny. Weigh 6.6 grams. 1 1/2" long. Fine design.